President lights Hanukkah candles with crews from Ramon Air Force Base, warns Hezbollah leading Lebanon to ruin for Iranian agenda. 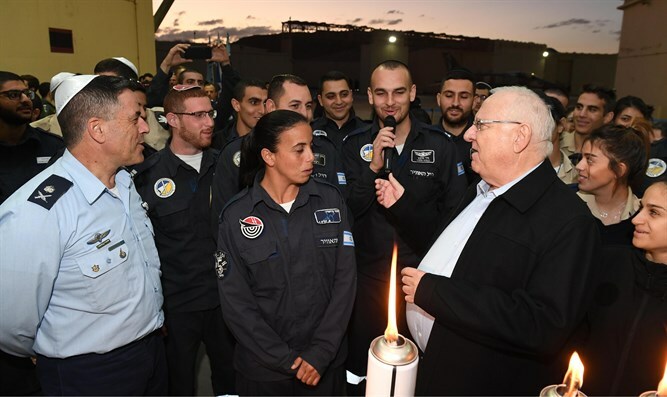 Israeli President Reuven Rivlin lit the third candle of Hanukkah Tuesday evening with the men and women of the 25th Wing of the Israel Air Force at the Ramon Air Force Base. IAF Commander Maj-Gen Amikam Norkis and commander of Ramon AFB Col. G also participated in the event. The president was briefed on the activities of the various squadrons on the base by the commanders and then viewed the aircraft that they use on operations. Meeting the aircrews, the president spoke about Operation Northern Shield, saying “last night, the IDF began Operation Northern Shield.